Hey there! It's Angie from The First Grade Scoop here. Today was my LAST day with students! I honestly wondered if the day would ever come. We still have a few days next week for PD, but that is much more doable. Today (well, this week) was a total whirlwind. We spent the day passing back papers, auctioning off anchor charts and other student giveaways, passing out old classroom library books for students to keep, and cleaning. We snuck in a couple Minute to Win It games as well. I think I had an exhausted group! I am trying to prep as much as possible for next year so I don't end up with a mile-long to do list that's only half finished the night before school starts. (Please tell me I'm not the only one who does this.) As part of my attempts to get on top of things, I've overhauled my folder and notebook labels. Am I the only one who struggles with formatting in Word sometimes? It is supergoofy at times. I LOVE using PowerPoint, but I wanted to make my labels printer-friendly and to print them on 2x4" and 3.3x4" labels (not an option in PowerPoint). 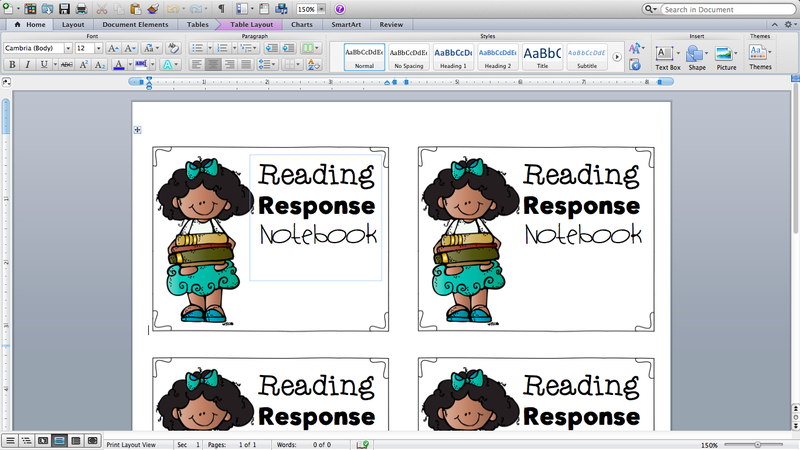 When I tried making cutesy labels in Word, I could put a pic inside a frame. Ugh. 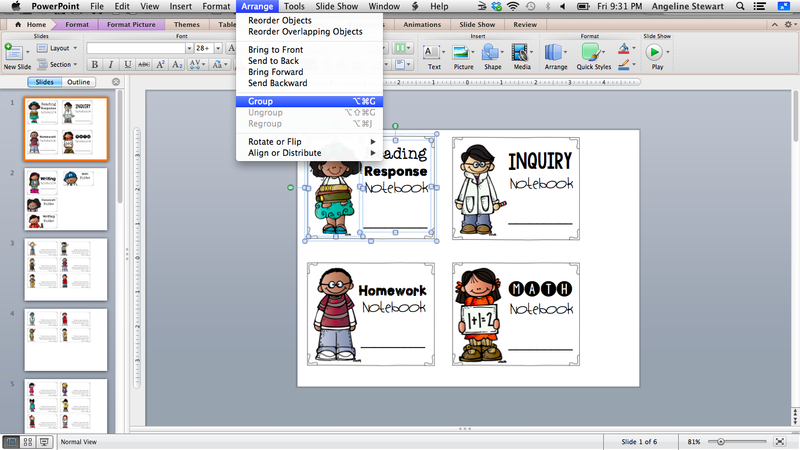 Open PowerPoint, create a new presentation, and design the labels you'd like to have. I made my border a couple tenths of an inch smaller than the label. I put the picture and text box into the border. I did this for each type of label I made. Then, I selected (just click and drag) the entire label I wanted. The border, picture, and text box for just that one label were all selected (like the little boxes were around each object). Then, I went to Arrange, and selected Group. Once you do this, the border, picture, and text box become one single image. Copy and paste this image into your labels in Word. 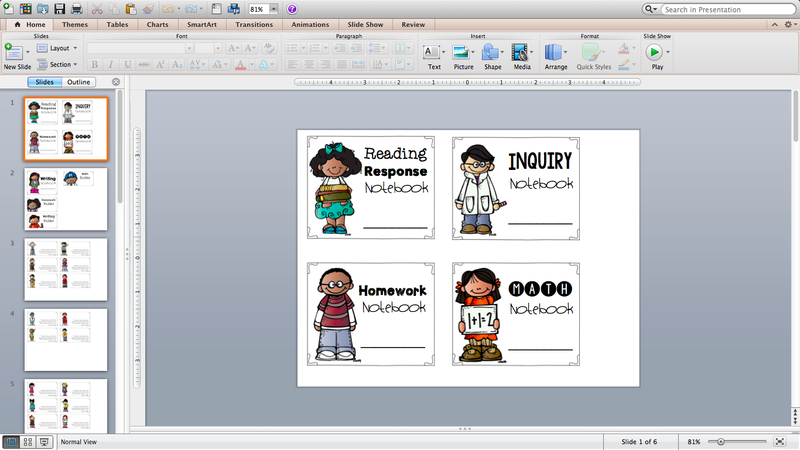 Occasionally, I had to slightly adjust font size and the size of the border, but all in all... A huge success! I was able to print these bad boys out on labels without problems! I hope this tip helps you to easily make cute labels that are fast to print. Enjoy! Thank you so much! I am always frustrated with Word and certainly did not know how to do this. You are awesome! I would LOVE it if you made some and put them on TpT!! I do appreciate the explanation though. There is still so much I don't know! lol Thank you for sharing the information.